The article is based on the recent "Nuclear Energy and Renewables" study "overseen by the Working Party on Nuclear Energy Economics (WPNE) of the OECD Nuclear Energy Agency (NEA)." I am yet to review the study, but Professor Brook's article indicates it's conclusions are plausible. The impact of any supply without capacity value (the ability to deliver power when required by demand) is to drive up overall system costs. The degree to which costs are driven up is difficult to ascertain; given the source of the study, I expected the figures to be challenged. 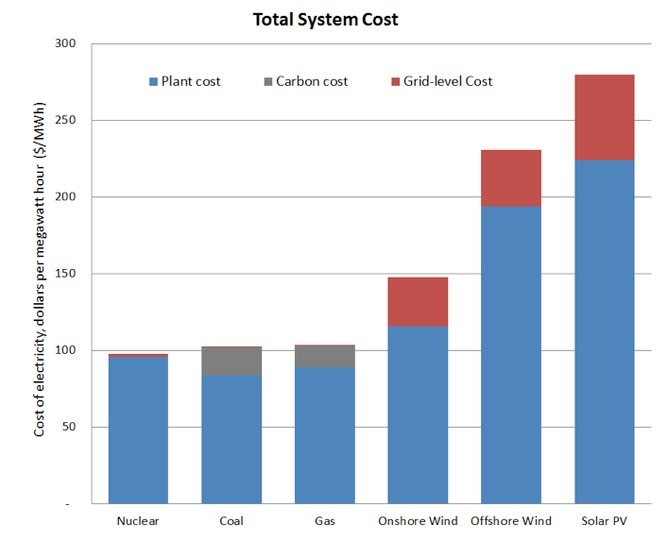 The first challenge I've seen is Busting myths on the system costs of renewables, and I must say, as a nuclear advocate, this initial response is encouragingly poor. The writer, a Jenny Riesz, feels that capacity markets should be an altogether different cost accounting - which is a rather thick-headed response as Germany fights to fend off the need for capacity markets (the minister having called them a fossil fuel subsidy), while the European Union is seeking input on methods to maintain adequate capacity under their higher renewables scenario (ENTSO-E Views on Security of Supply and Generation Adequacy is a challenging, worthwhile, read). Riesz seems unaware high, or no, caps on wholesale spot market prices are a suggested alternate to capacity markets. Texas, faced with a capacity reserve problem concurrent with it's large wind capacity, has been setting ever higher caps on wholesale rates in the hopes of avoiding capacity markets and/or strategic reserves, yet there is still no expectation that high prices that are likely to be realized for a very limited number of hours, will be sufficient incentive for merchant capacity to get constructed to the extent required to meet capacity reserve requirements. One issue, noted in a study undertaken for the Texas operator, is that for high pricing to be effective at allowing capacity to meet demand, demand response options must be available to a very large extent - and for that to occur it appears an enormous sum needs to be spent on smarter grids - so even the high price capacity option requires higher system costs when supply lacking capacity value is a large part of the supply chain. Riesz then suggests less efficient natural gas generators (OCGT) will get built making wind cheaper - although in Europe the outcome is not looking to be OCGT but COAL.